غزو الجزائر في 1830 كانت عملية عسكرية واسعة النطاق قامت بها مملكة فرنسا، في عهد شارل العاشر، بغزو واحتلال العثمانية Regency of Algiers. وقد كانت مدينة الجزائر محمية للدولة العثمانية منذ الاستيلاء على الجزائر في 1529 من قبل برباروسا. حادثة دبلوماسية، هي حادثة المنشة، served as a pretext for the invasion, which was instigated by Charles X to divert attention from French domestic affairs that culminated with his deposition during the later stages of the invasion in the July Revolution. غزو الجزائر بدأ في 5 يوليو 1830 بقصف بحري من أسطول بقيادة الأميرال دوپريه، وإنزال قوات تحت قيادة لوي أوگوست ڤيكتور ده گين، كونت بورمون. وقد هزم الفرنسيون بسرعة قوات حسين داي، الحاكم العثماني، إلا أن مقاومة الأهالي كانت على نطاق واسع. This resulted in a protracted military campaign, lasting more than 45 years, to root out popular opposition to the colonisation. The so-called "pacification" was marked by resistance of figures such as أحمد باي والأمير عبد القادر وللا فاطمة نسومر. The invasion marked the end of several centuries of rule in Algeria and the beginning of French Algeria. In 1848, the territories conquered around Algiers were organised into three départements, defining the territories of modern Algeria. 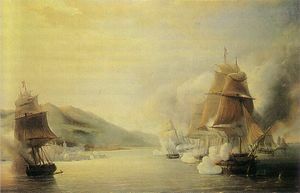 Landing at Sidi Ferruch on 14 June 1830. 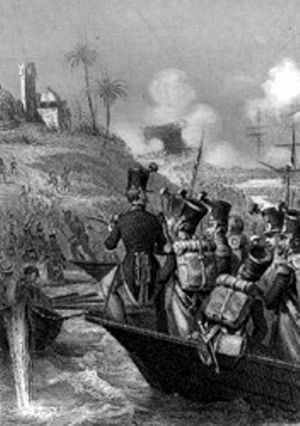 French troops landed at Sidi Ferruch on 14 June 1830 against minimal opposition. Within a few days, however, troops of Algerian caids started to rise against the invaders. On 18 June, Hussein Dey assembled a 10,000-man army, comprising 1,000 Janissaries, 5,000 Moors and 30,00 Arabs and Berbers from Oran, Titteri and Medea. Bourmont merely kept the counter-attacks at bay until 28 June, when siege weapons were landed, making it possible to attack Algiers itself. Fighting at the gates of Algiers. 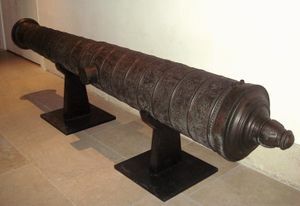 Ornate Ottoman cannon, length: 385cm, cal:178mm, weight: 2910, stone projectile, founded 8 October 1581 in Algiers, seized by France at Algiers in 1830. Musée de l'Armée, باريس. Grand culverin of Francis I, with royal salamander emblem and with the Latin motto Nutrisco et extinguo ("I nourish [the good] and extinguish [the bad]"). 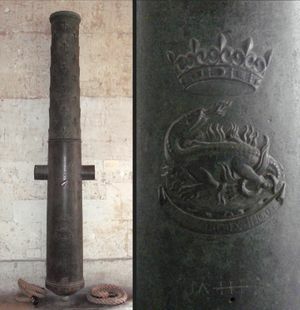 Caliber: 140mm, length: 307cm, recovered in Algiers in 1830, a remnant of the Franco-Ottoman alliance. Musée de l'Armée. Sultan-Khalessi, the main fort defending the city, was attacked on 29 June and fell on 4 July. The Bey then started negotiations, leading to his capitulation the next day. 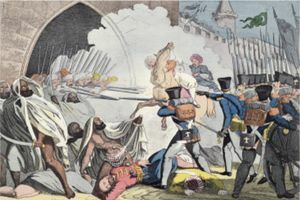 At the same time, in France, the July Revolution let to the deposition of Charles X. French troops entered the city on 5 July, and evacuated the Casbah on 7 July. The French had 415 killed. The Dey was exiled to Naples, and some of the Janissaries to Turkey. Bourmont immediately instituted a municipal council and a governmental commission to administer the city. Before the new status of Algiers could be settled, Bourmont struck at Blida and occupied Bône and Oran in early August. On 11 August, news of the July Revolution reached Algiers, and Bourmont was required to pledge allegiance to Charles' successor Louis-Philippe, which he refused to do. He was relieved of command and replaced by general Bertrand Clauzel on 2 September. Negotiations were started with the beys of Titteri, Oran and Constantine to impose a French protectorate, spreading French influence over the entire former Regency.